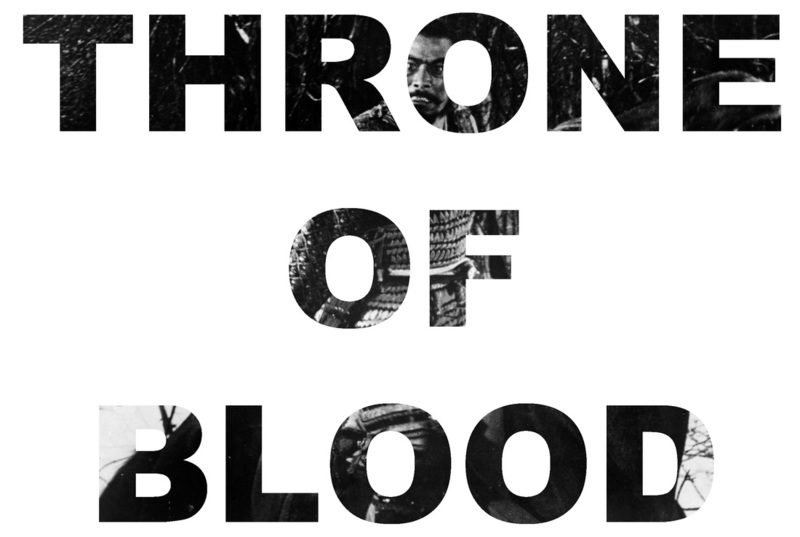 This a movie review of THRONE OF BLOOD. Gifted film-maker Akira Kurosawa was later to turn KING LEAR into RAN, but first he tackled MACBETH as THRONE OF BLOOD, released in 1957. The popularity of MACBETH with film-makers can be seen as recently as the Australian adaptation, in UK cinemas last month, updating proceedings to gang warfare. 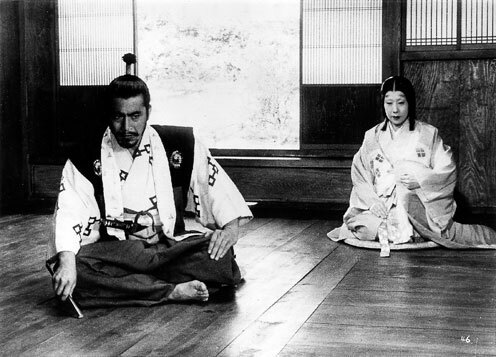 Kurosawa decided to interpret the play through the prism of a samurai tale dealing with greed, power, betrayal, sanity, treason, honour, trust, murder, guilt, loyalty and paranoia. 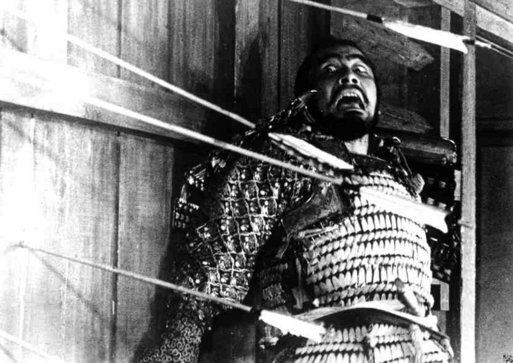 THRONE OF BLOOD opens with a memorial proclaiming the “Site of Cobweb Castle”, and a song about a man’s lust for power and his will weakened by a woman. The fog around the memorial parts to reveal Cobweb Castle in the past and the history of its demise. Straightaway we are launched into an insurrection by Inuis and Fujimaki against Lord Tsuzuki, but it is routed thanks to Washizu and Miki. On the way to be congratulated by Tsuzuki they have to pass through Cobweb Forest, and come across an ominous spirit who makes several predictions: Washizu will be rewarded with the Northern Mansion, Miki shall be given the first fort, Washizu is to then become Lord of Cobweb Castle, and after him Miki’s son. Both are loyal men and think nothing much of it until the first two predictions come true. “I am satisfied with my lot. I will remain loyal to His Lordship. I want to live in peace” Washizu to his wife, Lady Asaji. Lady Asaji has other ideas and is greedy for her husband to have unchallenged power over the land. She plays on his fears and weaknesses and quietly forces him to kill Lord Tsuzuki and lay the blame on others. Now Lord of Cobweb Castle, guilt and paranoia set in for Lord Washizu. Director Kurosawa and his cinematographer certainly know how to frame and light, with artful compositions and austere beauty. The sets are also interesting – the large, barren rooms that Washizu and Asaji converse in are probably a metaphor for the moral barrenness, absence of warmth, and no children. Kurosawa’s regular actor, Toshiro Mikune, demonstrates his range. Compare his Washizu to his performances in SEVEN SAMURAI, YOJIMBO and RASHOMON. Also, Isuzu Yamada as Lady Asaji has a real menace, like a coiled cobra; a character equally as merciless as Mieko Harada’s powerful turn as Lady Kaede in RAN. This is a masterclass in camera-movement and editing – one scene has a disturbed horse unable to be saddled, where the cuts seem to reflect the animal’s agitation. 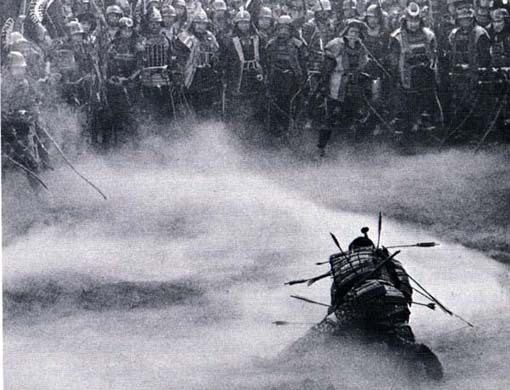 Like so much of Kurosawa’s work a long lasting impression is felt when the credits roll. The death toll is large and the images are striking.